Building on the success of its sister organization, the European Venture Philanthropy Association (EVPA), in Europe, the Asian Venture Philanthropy Network (AVPN) is developing the venture philanthropy movement across the Asia Pacific region. Currently recruiting founder members ahead of an official launch later this year, it ran a series of roadshow events last year in Mumbai, Singapore, Hong Kong and Tokyo. Alliance asked AVPN chair Doug Miller and CEO Simon Chadwick what they see as the critical challenges for the adoption of the venture philanthropy approach in Asia and how much progress they have made so far. Venture philanthropy started in the US, and the EVPA has been hugely successful in Europe. Why Asia next? DM When we started EVPA, the idea was to do a roll-out on a global basis, so once EVPA was up and running we would go to the next market, which, logically, was Asia. It’s a very dynamic market where people are early adopters of new ideas and they have both philanthropic capital and social issues to address. What countries are you going to be starting in? SC We have been researching the market for the last two years and expect venture philanthropy to grow more quickly where it is already being practised. That means India, Hong Kong and Singapore, with the next largest countries being China and Japan. From the research we’ve done, there are around 200 organizations that are active supporters of venture philanthropy in Asia and about 40 or 50 practitioners. One of the topics of the AVPN roadshow was applying venture philanthropy to grantmaking and impact investing strategies. How does it apply in each case? Do you see the most interest coming from grantmakers or impact investors? SC Venture philanthropy is a method for selecting investments and actively engaging with them for several years. You can apply that method to grant funding for non-profits or debt and equity for social enterprises or social businesses. What’s interesting in Asia is that there’s a very dynamic trend towards social enterprise, which is often being encouraged by governments. We have a lot of interest from people who are not looking at established not-for-profits but at organizations that have a social mission and are able to take investment. The rise of impact investing is creating a lot of interest in the venture philanthropy approach. Is lack of deal flow going to be a problem? SC Because social investing and venture philanthropy are relatively new in Asia, there is limited deal flow at the moment. Currently, practitioners may typically be doing two or three transactions a year, but are having to develop a very wide deal pipeline to support that. We expect this to improve as venture philanthropy and its practitioners become more visible. One challenge is to help social enterprises and charities become more familiar with what a venture philanthropist is looking for and the support VP can provide. You work across both grantmaking and investments. Do you think deal flow will be more of a problem on the investment end of the spectrum than at the grantmaking end? DM The NGO sector has been around for many, many years and social enterprise for maybe ten years or so, so it’s only natural that you’d have a lot more deal flow on the non-profit side. But social investment is starting to take off. We saw more or less the same thing in Europe. Deal flow in both non-profit and social enterprise is challenging because you’ve got to find the right management teams and the right products and services. The promotion of venture philanthropy will help the impact investing deal flow in these countries because a lot of social enterprises need grant funding and capacity support for the first three to five years of their development. 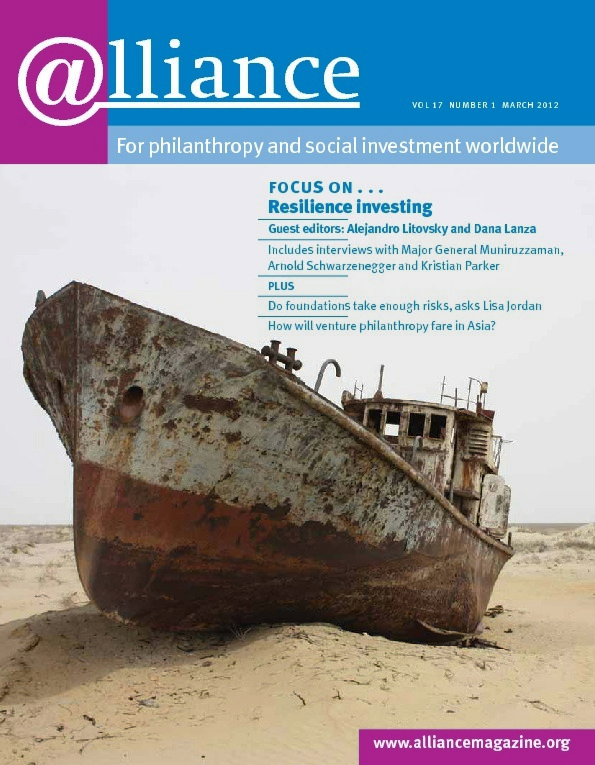 What are the other challenges to developing venture philanthropy in Asia? SC First, I think the key challenge is educating a far broader group than is currently involved in venture philanthropy. We’ll be offering examples of the way VP organizations work in Europe and in Asia. Once potential VP funders see others active in their country or the region, they will begin to think about how they themselves could become active. Second, one of the critical challenges is engaging enough people to bring their experience and talent to the process of selecting promising, fast-growing social enterprises and charities, and then working with them on a pro bono basis. For Asia, that’s a very new way of providing philanthropic human capital. Is there a shortage of people willing to invest? SC I think there is a lot of available capital in Asia. What’s missing are the teams and people with sufficient grasp or experience of venture philanthropy to start deploying it. So you will see relatively small investment amounts and small funds at the moment. Our job is to promote the sector and to help by training in best practices. How important is it to develop commonly accepted ways of measuring social impact? DM I think it’s absolutely crucial because what we’re trying to do is to improve the efficiency and effectiveness of the sector. But you need to keep measurement simple and relevant to the work that the individual management teams are doing. With EVPA, we found that a lot of the academic work around performance measurement is not feasible with small teams. The other thing is that if a philanthropist has limited capital, you need to come up with some form of measurement that lets you know where to allocate it. Each investment is different. You agree with the management team what the parameters should be, how they should be measured, when they should be measured and the effort that that’s going to take. The objective is to improve the team’s performance. Does AVPN have any members yet? SC We do. We soft-launched at the beginning of December. One member applied on the day we sent out the invitation and we have been having a steady flow since then, but it’s too early to talk about numbers. We want to have a strong and representative group of founder members across the countries where we see a lot of activity already. We hope to have around 60 members by the end of March. The EVPA began with 14 members in 2005 and now has over 140. What are the next steps for AVPN? SC We plan to engage our members through a series of events in key Asian cities. We will be holding roundtables for members and their guests for sharing information and experience and also seminars to promote VP more generally. Our big event will be a regional conference in early 2013. We will be publishing some research reports and how-to guides, bringing in case studies from Asia as well as relevant content from the EVPA Knowledge Centre. DM We worked on EVPA for almost six years before we launched AVPN. We’ve been doing research on the Asian markets for almost two years, so it’s my belief that we’ll have to focus all of our energy and resources on Asia for at least two years. But in 2014 or so, my best guess would be the Middle East and Africa. It seems like Africa is presently where there’s the most interest. Ever since venture philanthropy has been going there have been comparisons with venture capital. Usually they have fallen down, often because there is no real exit in venture philanthropy. If you extend venture philanthropy to impact investing, does the comparison become more valid? DM Both VC and VP start with extensive due diligence and longer-term investment and then go on to capacity building and the human capital inputs. But they diverge in two areas. One is that as a venture philanthropist you don’t own these non-profits so your degree of influence is based on personal rapport and alignment of interest. With venture capital you have a significant ownership share and can change management if it’s required. The other major difference is that with venture philanthropy you usually don’t gain financially from your exit. You are actually passing that organization on to another funder. The organization is in a much stronger position than they were when you started, and that’s how you define success. As far as impact investing goes, the market is not yet developed enough to see whether you can produce the financial return and the social return that everyone is shooting for. Even in the UK, where the market is more advanced than elsewhere, it’s still early days. In the venture capital sector you lose 50 per cent of the investments that you make and the other investments produce the return. The upside on a successful venture capital investment might be a multiple of five to ten times your capital or more, and that’s very unlikely to happen with a social enterprise. The very positive thing about social enterprise is that it’s much easier to scale an organization if it’s cashflow-positive and it’s not always out fundraising. You can recycle capital back into the business. AVPN encourages supporting both non-profits and social enterprises.